We are proud to offer therapeutic laser therapy, an advanced drug-free and surgery-free treatment to relieve pain, reduce swelling and speed healing. 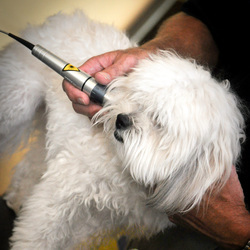 Laser therapy is administered in a series of short treatments, usually 2 to 8 in total. Acute (new) conditions benefit from daily therapy while chronic (long-term) conditions are initially treated every other day. Laser therapy works with the body's own healing processes by increasing circulation and improving cellular activity. Its direct impact on nerves reduces pain, so our patients often feel better after just one treatment. For all the medical details, check out the science behind K-laser.